Fiddlers 3! is a trio of violinist/fiddlers who share a fascination with the violin and the music that it can make. They share this fascination in concert by performing their arrangements of classical pieces, traditional fiddle tunes, and original or traditional songs.The group consists of Kate MacLeod, Bronwen Beecher, and Mary Danzig. All professional performing musicians, they have been contributing to the Utah music community for many years.Kate MacLeod is originally from the Washington DC area, but has lived in Utah since she moved to Salt Lake City to study violin making. Her original music has been recorded and performed by other artists across the country and into Europe. She tours internationally, is a studio musician, and is vocalist and fiddler for other touring artists. Kate has several recordings and books that feature her songs and violin instrumental pieces.Bronwen Beecher has gathered music and performance experience from a varied background that includes studying at the University of New Orleans, working as a street performer, and learning many styles of world music through her travels from Nova Scotia to China. She is founder and CEO of the Fiddle Preacher Music Teaching Studio.Mary Danzig is half of the nationally recognized folk/newgrass duo Otter Creek, where she is fiddler and vocalist. She is a Utah State Fiddle Champion who regularly trades her boots and jeans for concert black to perform as a member of the violin section in Sinfonia Salt Lake. 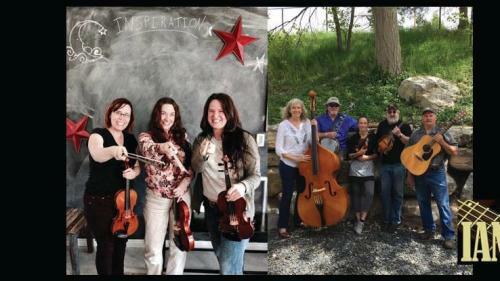 Mary currently teaches violin and fiddle privately, and at the Salt Lake Community College.The Rail Jumpers play traditional and original bluegrass music along with folk songs from the past.Playing rhythm guitar and singing most of the lead songs is Terry Rose, originally from West Virginia. He was inspired to play bluegrass as a young man when he attended many festivals with groups such as the original Seldom Scene, Country Gentlemen, and Osborne Brothers. Terry was also influenced by many other musicians from the 70s and 80s. Being from WV, he has a deep love for bluegrass music.Larry Swift plays mandolin and adds vocals. Raised in the Ozarks of Missouri, he has since been a SLC fixture in many bluegrass bands for many years. Larry has a very unique style with a great baritone voice to fill in the harmonies.Their newest and youngest group member is fiddle player, Anastasia Lund. She was the open fiddle champion at the Utah State Instrument Championships in 2016. Anastasia has been playing fiddle with Rail Jumpers for several years and does a great job filling in the spaces for this ensemble. She keeps herself busy in other groups as well.On bass is Janna Lauer. Janna has been playing bass for many years in SLC and in other regional music shows. Her superb playing keeps this group planted firmly on the ground, making Rail Jumpers a true band instead of a jam session. Janna is also the founder and Executive Director of the local non-profit Heart & Soul, which provides music to various isolated populations.Mark Anger is on 5-string banjo and adds another voice. He has been playing for some 50 years, and has been with local well-known bands such as the Mountain Dogs, Rick Martinez Band, Bluegrass Conspiracy, Buyin’ Time, and Good Grass. While his skill is obvious, it’s also clear that Mark is always having fun – which is why he is a true fit for the Rail Jumpers!